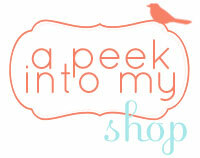 Lu Bird Baby: Bit of Whimsy Dolls Giveaway! "I've been sewing since I was 5 years old and made a lot of my own clothes from middle school up until my oldest son was born. Once he came into my life, my focus became baby clothes, baby quilts and bibs. When my daughter was born, I wanted to find her the perfect "first doll" before anyone else did! I couldn't find anything I really, really liked so I settled for a pink velour standard issue baby doll. I continued to sew and even sold a variety of items on eBay for a few years. I started making patterns for a few of my creations, mainly sweet primitive dolls. A friend of mine told me about Etsy and I listed one of my patterns. I sold 4 patterns in 8 months! 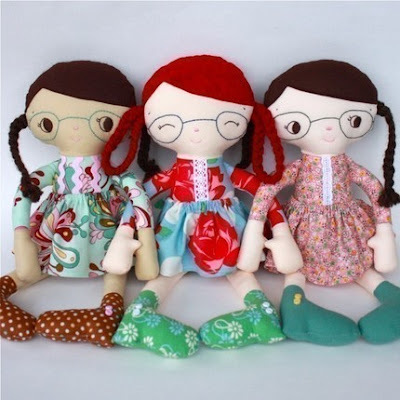 I had the idea to start making play dolls instead of display raggedy dolls because I could never find the style of pattern I was looking for when I wanted to sew for my kids. 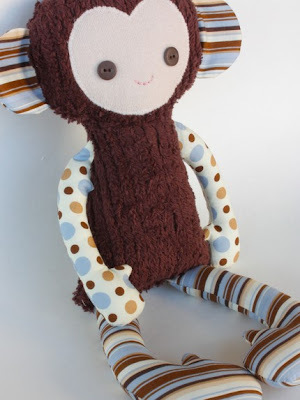 I made Millie Monkey, released the pattern and decided to really work on my Etsy shop. A week or so later, I finally made my daughter the doll I wanted to find her when she was born and Doodle Girl was born. Since then, my daughter has been my main inspiration. She tells me what she wants and I do my best to make it!" How a.d.o.r.a.b.l.e. are these girls! And who said boys can't have dolls! Here is a cute manly version for your little dude. Check out that eye patch! of her adorable patterns (of your choice)! That means there will be t.h.r.e.e. separate winners! I secretly wanted to keep one of the patterns for myself. I think I might just have to purchase one to make for Mackenzie. I know she would LOVE it! The hard part will be deciding which one. Sarah also has a ton of cute animals and dolls that she has made for sale. 1. Visit Bit of Whimsy Dolls shop. 5. Follow Sarah on Twitter. 5. Leave a comment telling us your favorite Easter tradition. I love the butterbean babies. They are so sweet. I love all the patterns but the Butterbean babies are my favorite. So Cute! I especially love Beth and Liberty Lion. My favorite Easter tradition is dinner with the family. I love the Beth dollie because my little girl has worn glasses since she was a toddler which makes her feel uncomfortable at times. I think that she would love to have a baby doll that looks like her! My favorite Easter tradition is stenciling baby powder pawprints all over my house. My Mom did it for us when we were kids and I've carried it on with mine. I love all of Sarah's patterns- but my current favorite that I don't own is the owl. I love all of them! I just bought Lilly the Lamb last week and made on for my daughter's Easter basket. Great e-pattern! Easy to follow and the lamb turned out too cute. I am drooling over many other patterns though! Just blogged about your giveaway! Now a follower of Sarah on Twitter! Now a follower of you on Twitter! I always look forward to my mom taking me and my siter shopping to buy our new Easter outfits every year. Now I get to enjoy doing this for my daughter...this year I made her outfit and love that I was able to do this! It is just too incredibly hard to decide! I think I love them all! If I had to choose a right now favorite it would be Lenny the Guinea Pig!! But they are really all too cute! I love the butterbean babies. Just became a follower of Sarah/Bit of Whimsy on twitter. 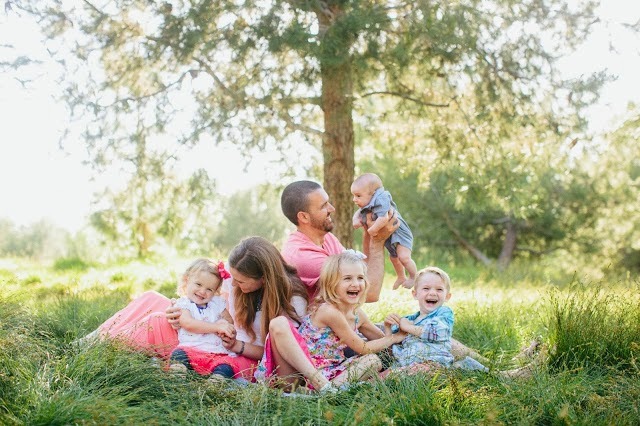 My family's favorite Easter tradition is taking our little ones to have pics with real live bunnies. I love to see how their reaction's change every year. Grace's first year (she was almost 1) she wouldn't touch the bunny at all, her second year she wanted to take off with the bunny, basket and all. This year, she was so sweet and giggly with the bunny! And our little guy - Hudson - he's 9 months and LOVED the bunny...almost too much. He SQUEEZED that little bunny so hard I feared for the bunny's life! I love Finnegan Fox - he's so cute! Favorite Eater tradition is not mine but an Armenian friends - chitchit eggs, not sure if that's how it's spelled. Basically hard boiled eggs are knocked together by two contestants, whoever breaks their egg loses. Fun! My favorite is the Beth doll epattern. I have been a fan of Sarah's for quite a while now -- I think have purchased 7 patterns and love them all. I think my new next want-pattern is Katie the Kitten. my favorite easter tradition (starting this year!) is taking my baby girl to see the easter bunny & getting her photo taken, and buying & making pretty things for her hello kitty easter basket! 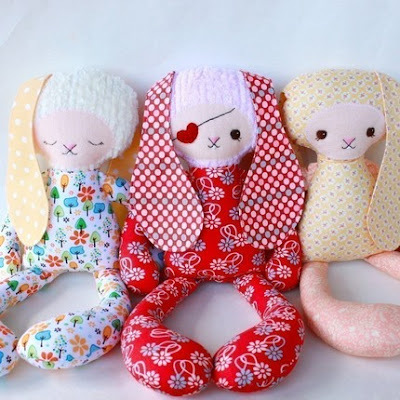 &... my favorite item from her shop is the bunny pattern -- I purchased it last summer and made my daughter a few of them before she was born! :) They're all lined up in her crib! Favorite Easter tradition: There was a small pond near my granparents' house. We'd go there and our Grandpa would take a nice family pic. my favorite easter tradition is dying the eggs with my kids. when we get to the last egg it must go in every color to create what we call the mud egg! what is so fun is that this tradition has been passed down from my mom to my brothers and me and now to my kids and all my nieces and nephews. I love it when a tradition gets passed down! I follow your blog via bloglines...does that count?! I love them all! So cute, but my daughter has a thing about elephants. 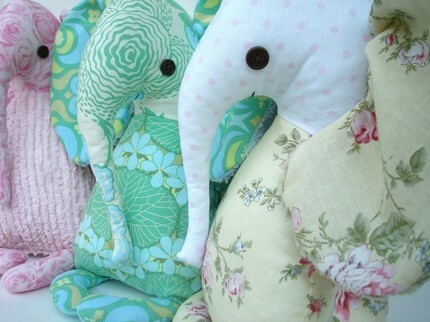 She loves them so I would have to pick Elodie the Elephant! I love the Easter Egg Hunt! We always have lots of family and lots of eggs. It's so much fun! I adore so many, it was hard to pick. It is between Camryn the Kitten or Roger the Monkey! An easter tradition we always had that I have continued was making little chocolate nests out of shredded wheat and mini eggs! SOOOO cute!!! I love the dolls. It's hard to pick a favorite with Bit of Whimsy since these are already among my favorite patterns! I don't have the Harper Hedgehog pattern yet and my oldest daughter is quite taken with that pattern, so I'd pick that as a current favorite. I just became a follow of your blog! I already follow her on Twitter! Just became a follower! I LOVE these dolls! I just love all the items on the Etsy shaop, but it seems that the Mae doll has stole my heart! I love the Mae Doll and know my little girl would love it too! My favorite Easter tradition is hiding the easter baskets that are full of goodies! Welllll I love all her patterns and have about 8 of them, but I want that sweet Pony soo bad!!!!!! So Cute! I especially love Beth and Liberty Lion. Just saying you are very inspiring. Thanks!